“Housing is an essential sector of every country’s economy, but it has also been a source of instability for financial institutions and countries. 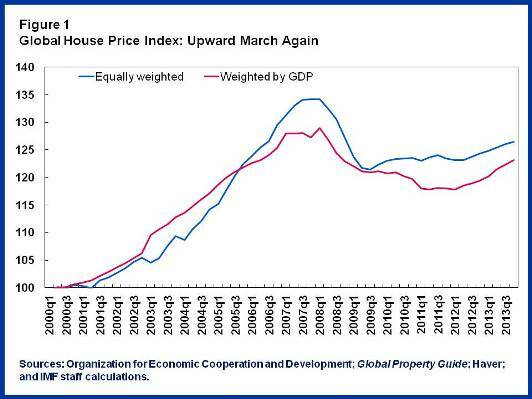 Understanding the drivers of house price cycles, and how to moderate these cycles, is important for economic stability. “We do have a set of policy tools that can help – sometimes these are referred to as “Mip-Map-Mop.” Microprudential (Mip) policies look at an individual bank’s balance sheet, for example to determine if it is making too many real estate loans. But it could be that the individual banks are doing what seems healthy for them, but what the banking system as a whole is doing needs results in an unhealthy growth in lending. So, in addition, macroprudential regulations (Map), operating at the level of the financial sector as a whole, come into play. The most commonly used measures cap how much individuals may borrow relative to their income. These prudential measures are being increasingly used by countries to prevent an unsustainable build-up in debt. Finally, there is the monetary policy (Mop) that involves the central bank raising interest rates if they want to cool off the housing sector. This can be tricky, because sometimes the economy is weak but the housing sector is booming, and raising the interest rate can harm the overall economy. I will be keeping an eye on this website and the twitter hastag #HousingWatch. I expect some revealing and fascinating data to flow through here. 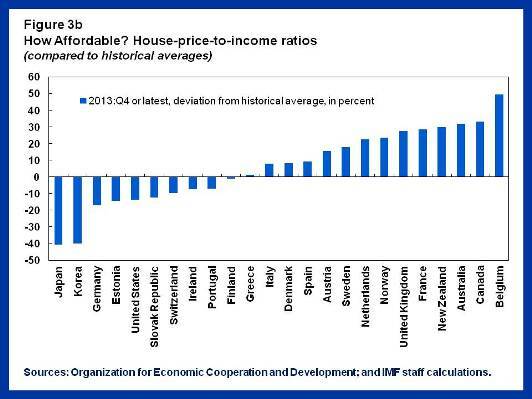 Here are the charts posted on the site showing the relative valuations of housing across the globe. I highly encourage the reader to go directly to the website and browse for yourself. I also hope to write some pieces covering the housing markets in the UK, Canada, and Australia in particular in coming weeks and months. 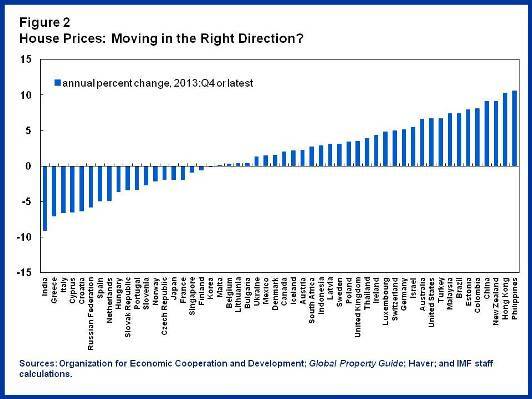 Note well that the U.S. is NOT in bubble territory (in the aggregate)…. On November 4, 2011, NPR’s Planet Money did a “blast from the past” podcast reviewing the course of events that led to the rice panic of 2007 and its eventual end. From India’s decision to ban rice exports to hoarding across Asia to corrupt government manipulation in the Philippines of a then vulnerable rice market, we get to reminisce about how rice prices doubled ad then almost doubled again in just four months. The panic finally ended after economists convinced the U.S. to allow Japan to sell its stockpile of rice that it maintains as part of a trade agreement that forces Japan to buy rice from the U.S. it does not want. Ironically enough, the rice was never sold but the psychological impact of the announcement was enough to end the hoarding and bring the market back to a semblance of sanity. A truly fascinating tale of a completely avoidable bubble in the price of rice. Land prices have doubled in Iowa over the past few years. The team at Planet Money conclude that the land boom throughout the agricultural U.S. Midwest is being driven by “real” economic forces. They identify low interest rates, grain traders, and government subsidies for ethanol as key drivers of this boom. Low interest rates are enabling land purchases. Grain traders and the demand for ethanol are driving up corn prices which in turn make land for growing corn more dear. Starting with auctions in Iowa, Planet Money takes us to a part of the country that is booming while much of the rest of the country is stagnating. Finally, one “seasoned farmer” warns that this boom is indeed a bubble and points to the crash in land prices in the 1980s after a similar period of exuberance. 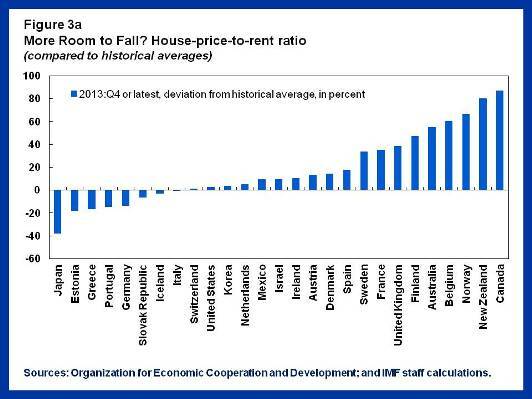 A housing bubble in Switzerland? The Swiss National Bank (SNB) has been extremely reluctant to increase interest rates, presumably because its currency has been excessively strong. Meanwhile, its forecast for near-term inflation has increased, and the economy has performed reasonably well despite the strong currency (although tourism and exports have recently suffered a bit). “Provincial and municipal governments in areas experiencing rapidly rising property prices may temporarily restrict the number of properties people may buy, in accordance with the situation in their jurisdictions, the State Council said. Specifically, banks are being asked to increase down payments and mortgage rates for people who already own two homes or more. Apparently, China has a working definition of an asset bubble and is getting increasingly proactive about preventing (or slowing down) rampant asset inflation. In “Housing Rebound in Canada Spurs Talk of a New Bubble” the WSJ paints a familiar picture of what can happen to an asset market when interest rates drop to extremely low levels. Although Canada never experienced a housing crash like that of the U.S., the Bank of Canada still dropped rates to near-zero to help support the domestic economy. Its efforts to support exports (primarily to the U.S.) have been thwarted for much of the past year given the sharp rise in the Canadian dollar. The average home price rose 23% from the trough in January, 2009, hitting a record according to one broad measure. Home-sales volumes are up 70% since January, 2009. Housing starts in December reached levels last seen October 2008 (no indication whether these stats were seasonally adjusted). The Canadians avoided the worst of the recent global meltdown. Let’s hope they did not avoid the fire only to land in the frying pan. “Property prices across China’s 70 largest cities surged at their fastest pace since 2008 in December, stoking rising anxiety in Beijing that a speculative bubble may be forming and that Chinese banks may have issued more than £70 billion in new bank loans since January 1.